Thermaduct™ is a pre-engineered duct system that incorporates the duct, insulation and cladding all in one high performance product. The duct system is available in a variety of thicknesses that supply R-8 through R-24 insulation value. While other manufacturers use tapes, adhesives and screws, which experience degradation over time, Thermaduct™ uses a patented heat or chemical welded seam to ensure impervious water and air integrity. We recognize the growing demand from owners for energy efficiency. Managing a building's HVAC system’s energy use offers a number of challenges including the HVAC equipment itself, the system control and the “grid” or distribution of that energy. Thermaduct™ uses high quality, closed cell phenolic to create some of the highest R-values available on the market today. Pair this with a 1000 micron Vinyl cladding and Thermaduct™ truly is the last line of defense between your insulation values and the outdoor elements. By choosing Thermaduct™ for your next project, you can expect high quality products from highly skilled workers that ensure your project exceeds the client's expectations with a weather resilient and energy efficient HVAC system. ange, aluminum channels OR cohesively bonded vinyl couplings. Once installed, all seams are sealed completely for uncompromising integrity and one of the best outdoor duct warranties in the industry. Learn how choosing the right outdoor HVAC ductwork can solve many of the issues experienced by traditional metal duct. Built in the USA. 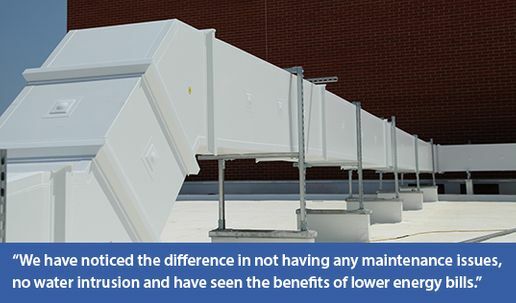 For your outdoor ductwork, the right products can make all the difference. Choose Thermaduct™ for your next project!